The only good way to protect your clothing is not to get epoxy on anything that you care for. Use a shop apron and don’t make layups in good clothing- A surplus flight suit or other cheap coveralls are a good investment. You may feel that layups are real messy work after your first experience with them. However after you’ve done several, you will have learned not to wipe your hands on your clothing (keep a roll of paper towels handy), not to scratch your ears, eyes, etc. during the layup. If your tools and work area are clean and organized well and you are disciplined with the epoxy, the job can be lot less messy than working with other materiels. When a layup is wet, you can only scissor trim to within about 1/4 inch without disrupting the fibers in the ply. An easy clean trim can be obtained by waiting three to five hours after the layup. At this time, the laminate is firm enough to support the cloth from fraying, yet soft enough to cut easily with a sharp knife. This “knife trim” stage is the optimum time for edge trimming with ease and accuracy. Take a sharp, single-edge razor blade or X-Acto knife and trim the edges with a motion downward toward the edge. Experience will help you determine the correct time in the curing cycle for optimum knife trimming. In the plans when "knife trim" is called for, this assumes the three to four hour wait, even though not specifically stated. Don’t fall apart if you miss the knife trim stage and have to trim the fully cured glass. If you wait until the layup is completely set, then saw along the edge with a coping saw, dremel, bandsaw, saber saw, etc. Smooth the edge with a sanding block. When trimming a cured edge, be careful of the “needles” (sharp protrusions of glass—frayed edges supported with epoxy). The needles can be avoided by returning three hours after the layup to make the knife trim. 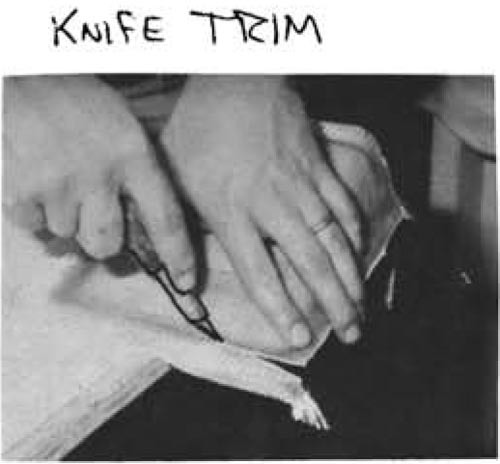 Knife trim time varies with temperature: apout six hours at 60 degrees and one hour at 90 degrees. Surface preparation (step 3 of the basic glass layup) varies with the material that you are laying up over. The layup over foam was covered in detail in step 3. To prepare a cured glass surface for layup, the cured surface must be sanded to a completely dull finish with 36 to 6O-grit sandpaper. If any of the glossy surface remains, an incomplete bond results which is weak. Better yet, use peel ply as described later. Micro slurry should not be applied to glass surfaces being bonded, this weakens the joint. Wood requires no special preparation for bonding but should be free of grease, oil, paints, and varnish. Sand wood surfaces with 30-grit sandpaper before layup. Metal honding is not relied upon for strength but metal surfaces should be free of oil and grease and, except for bolts, nuts, and other fasteners, metal surfaces should be dulled by sanding with 220-grit sandpaper, and coated with epoxy before setting in place. Cured micro surfaces should be sanded dull but be careful not to obliterate surrounding foam surfaces while doing it. In practice you may be glassing over several types of material in the same layup and you will be using most of these surface preparation techniques together. One of the unique features of the glass-foam-glass composite construction technique is your ability to visually inspect the structure from the outside. The tranaparancey of the glass/epoxy material enables you to see all the way through the skins and even through the spar caps. Defects in the layup take four basic forms: resin lean areas, delaminations, wrinkles or bumps in the fibers, and damage due to sanding structure away in finishing. Resin lean areas are white in appearance due to incomplete wetting of the glass cloth with epoxy during the layup. Dryness Criteria - Pick any 6”x 6” square in the layup in the critical area. Assess carefully if any evidence of air in the layup is present (white flecks, bubbles, air at the foam face). If the dryness evidence is more than 10% of the area, the part MUST be rejected. Reject or repair any evidence of dryness or voids in the trailing edge or leading edge overlaps. Better yet, do an adequate inspection with good light before cure when it’s easy to fix. If in doubt on overlaps be sure to stipple in enough epoxy. Delaminations in a new layup may be due to small air bubbles trapped between plies during the layup. The areas look like air bubbles and are distinctly visible even deep in a cured layup. Small delaminations, or bubbles up to 2-inch diameter, may be filled with epoxy by drilling a small hole into the bubble and filling the void with epoxy. When making a layup, do not be concerned if the brush occasionally sheds a few bristles-these do not need to be removed. If the bristle count exceeds about 10 per square foot, change your brush and remove bristles. Occasional sanding through the weeve in the first skin ply is not grounds for scrapping the part. Care should be exercised in areas, such as the skin joints not to weaken the structure in pursuit of an optimum finish. (Refer to Chapter 19 for details). An excess of resin (wet) will make your airplane heavy and does weaken the layup, but usually not enough to reject the part for strength reasons. Bump/Joggle/Dip Criteria - The best way to check this is to lay a 12-inch straightedge on the part spanwise. Move it all over the surface in the critical areas. If you can see 1/16” gap in any area, the part must be repaired. It is best to repair or beef up lumpy areas even if they meet this criteria, better yet, do a good job in core preparation and use your squeegee well in the layup to avoid the lumps in the first place. NOTE: A Reprint of the inspection criteria for homebuilt composite aircraft that has been distributed to FAA inspectors is included at the end of this chapter.